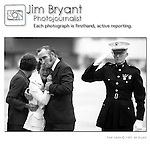 Jim Bryant is a freelance photo-journalist, picture editor, and teacher who has covered a wide variety of photo assignments ranging from local news and sports to international travel and war. He picked up his first camera at the age of 15 and has been taking pictures ever since. From the Central American rainforest to the ice sculptures in Japan's most northern island to the plains of Africa, it has been said that-Jim Bryant can't take an ugly photograph. Utilizing a strong sense of color, graphic design, lighting, composition and motion linked with human emotions I create images taken from split seconds of time that will never be duplicated again. I am a Port Orchard, Puget Sound, Kitsap Peninsula, Seattle and Washington based business offering a wide range of digital imaging services to Western Washington (and the world) specializing in sports,travel,editorial, corporate, documentary and annual report photography, Corporate, team and family portraits, Professional, college and youth action sports, Weddings, festivals and other special events. Stock images of travel locations include the Pacific Northwest, Japan, Thailand, Pacific Islands, Africa, Portugal, and Panama, College and Professional sports, Food and Fine Art. Digital Photography Classes and Seminars are taught from the beginner to a professional more advanced level. Pricing varies upon the requested level of expertise and the length of the classes needed. A 2013 inductee into the Defense Information Hall of Fame. Received over 60 National, State and Federal Awards in photography, including being a 1983 Pulitzer Prize Nominee in the General New Category. Jim Bryant is a freelance photo-journalist, picture editor, and teacher who has covered a wide variety of photo assignments ranging from local news and sports to international travel. He picked up his first camera at the age of 15 and has been taking pictures ever since. From the Central American rainforest to the ice sculptures in Japan's most northern island to the plains of Africa, it has been said that-Jim Bryant can't take an ugly photograph. A 2013 inductee into the Defense Information Hall of Fame. Received over 60 National, State and Federal Awards in photography, including being a 1983 Pulitzer Prize Nominee in the General News Categor and a 2013 Inductee into the Defense Information School's Hall of Fame.